If you're travelling by car and you're planning to stay at Emerald motel apartments while you're in town, you'll find that our superior serviced apartments offer you all the flexibility and convenience of your typical Emerald motel accommodation but with lots of extras. Not only do you get a comfortable and stylish place to rest your head, but you also get the benefit of a small self-contained kitchenette, meaning that you can rustle up a meal if you don't feel like going out to eat. There's also a private balcony so you can soak up the atmosphere of Emerald in peace, and with views looking out over the local golf club, it's a really pleasant place to kick back and unwind. 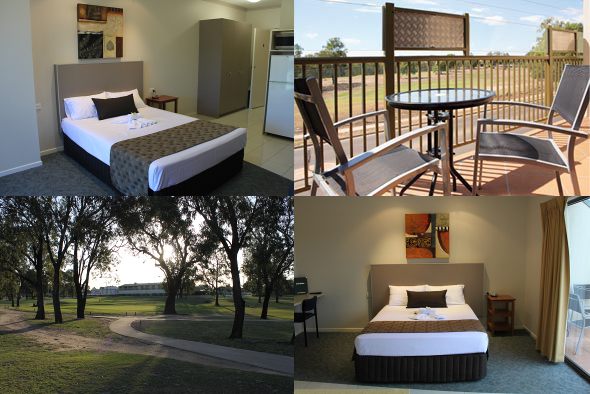 You can also enjoy all the comforts offered in our executive Emerald Apartments in Queensland, from the free TV and Wi-Fi connections to the well appointed spacious bathrooms with their refreshing showers. So the next time you're in town for business or planning a leisure trip to Emerald, why not check in to Emerald Motel Apartment Rooms? They offer the perfect opportunity to stay in comfortable and stylish accommodation at a very reasonable price. Whether you're planning to get out of town and enjoy some of the attractions of the great outdoors, explore the huge expanse of water created by Fairbairn Dam and Lake Maraboon which covers three times the area of Sydney Harbour, or you'd like to see the Southern Cross Windmill at the Botanic Gardens, or the world's largest Van Gogh sunflower painting at Morton Park; we offer well appointed accommodation for both business and leisure travellers alike at very affordable prices.